Google Authorship is simply a way to have your image show up in Google search results. Currently, not everyone is doing this, so for those who use it, it makes their page stand out from the rest and increases traffic to your site or blog. This post will give you a simple breakdown of how to set this up without using a lot of confusing technical jargon. There are a few steps, but if you take my hand I’ll walk you through it. Google+ is Google’s social media platform. If you don’t have a Google+ account, you can easily get one. Just go to plus.google.com and signup. NOTE: Currently, Google Authorship only works for PERSONAL accounts and not for corporate accounts. 1. For those who have a Google+ account, login or go to your Gmail account. In Gmail, you can link to Google+ by clicking the Google+ icon, which should be located somewhere at the top of the page. 2. 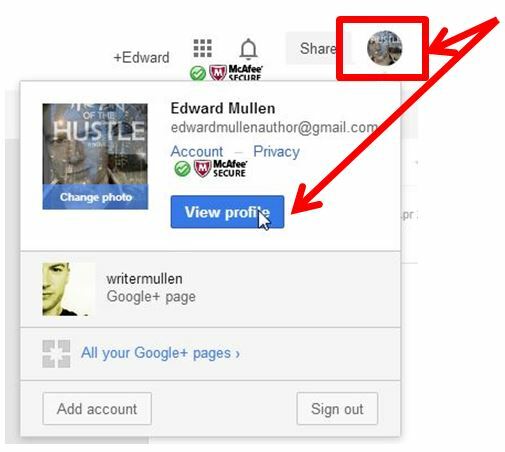 In your Google+ account, click “Profile”. The location of this can always change, but currently it’s located in the upper right corner. You will have to click on your image icon to open the menu. 3. After clicking “View Profile” you should see your profile. You then need to click the “About Tab”. From here, you should edit this information to say something relevant about yourself. This will “optimize”, or enhance your profile. 4. On the same page in the “About Me” screen, you should be able to see a section that says “Links”. 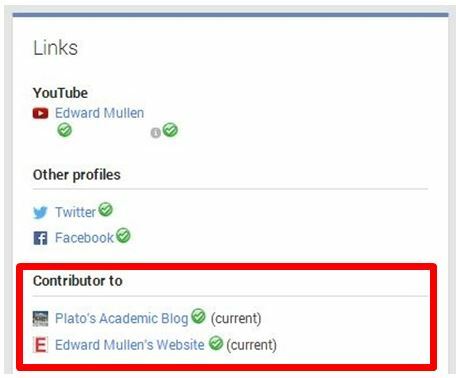 Here is where you need to add your blog or website to the “Contributor to” field. 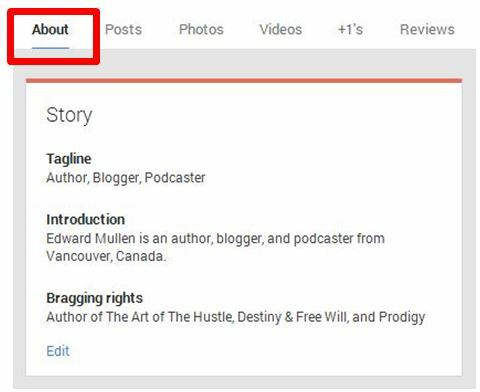 You need to establish a connection between your Google+ account and your blog or website. It is important to add this link on every page you want your picture to show up on. So if you have a blog, it should go on every post. 1. Find your numeric Google+ ID. This can be found by looking at the URL when you’re in your Google+ profile, and copy and pasting it where needed. 2. Take the following code, and paste in your Google+ ID, replacing my number with yours, and replace “Edward Mullen” with whatever message you want it to say. Usually your name is the best, but you could also put “By” – then your name, or “Written by” – then your name. NOTE: It doesn’t have to be bolded, I just did that to highlight the areas that need to be changed. 3. Once you have the above HTML code with your ID and name, you need to paste it into the HTML section of every page you want your picture to show up. So if you’re writing a WordPress blog, go to the right corner of your post, and click the “Text” tab. NOTE: It doesn’t really matter where you place the HTML code, but usually at the bottom of each post is good as seen above. 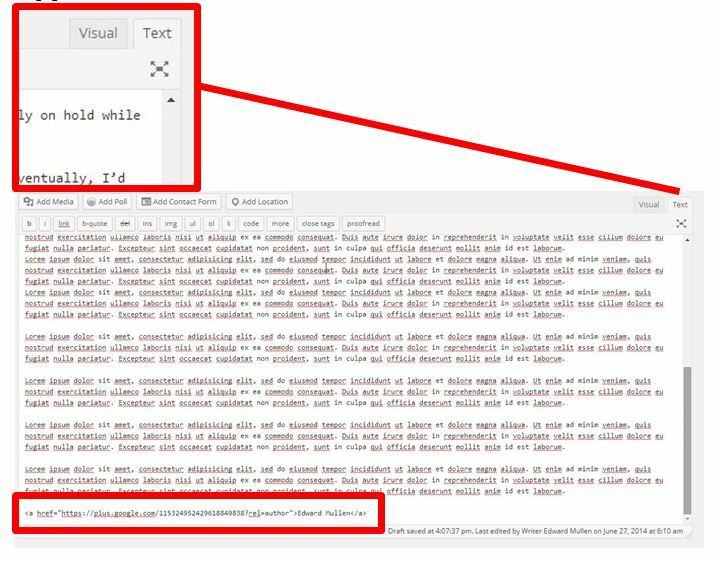 You want to be able to verify you have your Google Authorship set up correctly. 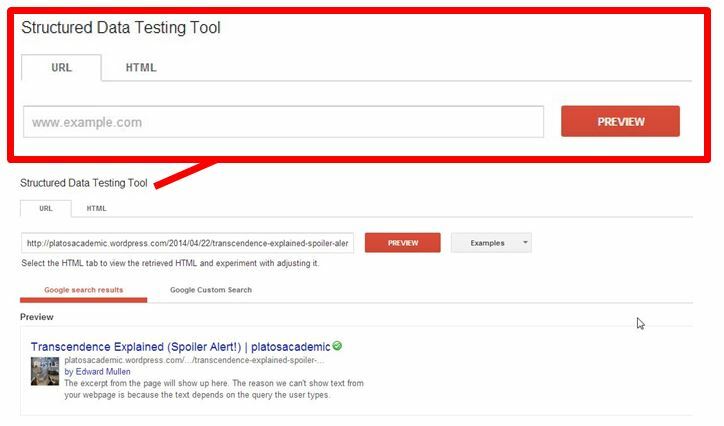 Paste in the URL link from your blog or site and click “Preview”. If it has been done correctly, your image should show up. NOTE: Google will only show your author portrait in search results when they think it will be useful to the user.